Oral irrigators are healthcare devices that are used to remove the plaque and food particles that are trapped between the teeth. Sometimes oral irrigator is called water flosser because it does the same job as dental floss. The flosser produces a stream of water or water an air mixture that flosses space between the teeth and gently massages the gums. 3 Can the flosser be used with mouthwash? The oral irrigators have been around for almost 50 years since the first prototype was developed in early 1960-ies. Since then dental care professionals have tested the device extensively and found out that it is nearly as effective as traditional dental floss. The added benefit of flosser is strengthening the gums and reducing the gum bleeding. It is proven that the stream of water the device produces massages gums very effectively and improves gums condition 50% better than regular dental floss. Irrigators are also a very effective means of taking care of your crowns, dental implants and orthodontic appliances like brackets. I was wearing braces for almost 3 years in my early 20-ies, and I remember how difficult it was to remove food like cookies from around the braces using a toothbrush. It will be an easy job if I have had an irrigator. Using the irrigator will be a great addition to your oral care routine. The according to Amazon customer votes the most popular irrigator manufacturers are Waterpik, Philips, and Oral Breeze. 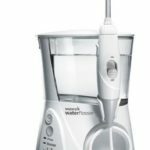 Waterpik offers 6 flosser models – 4 countertop models and 2 wireless flossers. 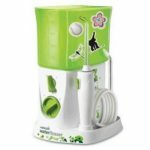 The countertop model range includes Classic and Ultra Water Flosser, a model for kids, and compact Traveller Water Flosser. There are also 2 cordless irrigator models. Philips introduced its Philips Sonicare Airfloss in late 2010. Sonicare Airfloss is a portable flosser that uses patented Microburst technology that produces a mix of water droplets and air. Flossing with Sonicare Airfloss is less messy because it uses only one teaspoon of water per cleaning. 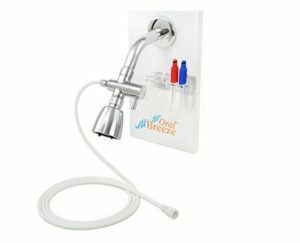 QuickBreeze and RediBreeze irrigators should be permanently attached to your bathroom faucet. It is a low-cost solution with its benefits and drawbacks. This unit comes with a covered reservoir and a covered tip storage. The water control is on the handle, and it has 10 pressure settings. The reservoir capacity of this model is 90 seconds, and it has 5 tips. It comes with a two-year warranty. This model has a covered reservoir and tip storage. The handle on this carries the water control feature. There is also a hydro pulse massage mode which uses an LED indicator. With 10 pressure settings and a 90-second reservoir capacity, this model has 7 tips and a three-year warranty. This has a covered reservoir and tip storage. The reservoir capacity is 90 seconds. The water control is on the handle, and it has ten pressure settings. There are six tips included with this and it has a three-year warranty. This has a Medicament Reservoir included. There are 6 pressure settings and 3 tips. Reservoir capacity is 90 seconds. The warranty on this model is 2 years. This model like its name is designed specifically for kids and has the look of one as well with its colorful and fun exterior designs. There are three pressure settings and a 60-second reservoir capacity. It has two tips included with it, and a warranty of two years. This Cordless Advanced (WP-560) handheld model uses inductive charging, has an electronic pressure control feature and 360-degree tip rotation. With three pressure settings and 45-second reservoir capacity, this model is waterproof. It has 4 tips and a two-year warranty. This model is waterproof and has two different pressure settings. The reservoir capacity of this flosser is 30 seconds, and it comes with three tips. It, however, does not have inductive charging, electronic pressure control or the 360-degree rotation feature. It has a one-year warranty. This cordless model features a 360-degree rotation of the tip and has two different pressure settings. The reservoir capacity is also a larger 45 seconds, but the downside is that it is not waterproof. It has 4 tips and two-year warranty. This one features total 360-degree rotation and 30-second reservoir capacity. It has a single pressure setting and two tips. The warranty is one year. The downside is it is not waterproof and does not have inductive charging. 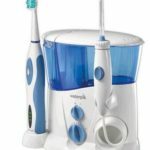 The cheapest of these 3 models, the Panasonic EW-DJ10-A Oral Irrigator has a maximum pump frequency of 1400 pulses a minute. The pump type on this is a Jet, and it has 2 water pressure settings. The 5.5 oz reservoir capacity covers approximately 40 seconds of use. The water tank part of this is dishwasher safe, and this has a collapsible design as well. It is powered by an AA battery. The Panasonic flossers are covered by 2 year limited warranty. 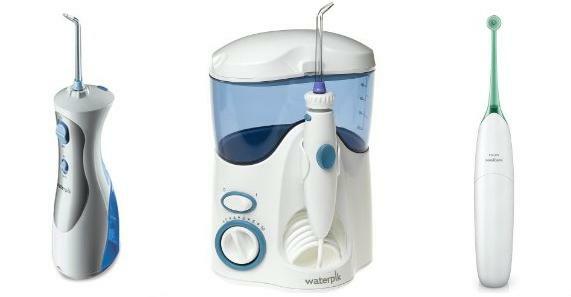 The EW1211A Oral Irrigator has a maximum pump frequency of 1500 pulses per minute. 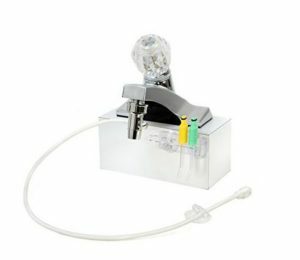 It has three different settings for the pressure while the pump type is a Jet an Air-In. The reservoir capacity is 35 seconds, and the volume is 4 oz. It is powered by an Induction charge, RC. The water tank part is dishwasher safe. 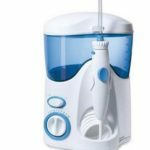 This oral irrigator from Panasonic has a maximum pump frequency of 1900 pulses a minute and comes with ten different pressure settings. The pump uses ultrasonic technology. This water tank is also dishwater safe, but not the entire device. The reservoir has a capacity of 115 seconds and volume of 20 oz. It is powered by an AC current. This is a prevention-focused tool that helps to prevent oral diseases. It helps to strengthen the gums and prevents bleeding. ShowerBreeze is easy to use, to store and there is no risk of bacteria breeding inside it. The materials used to make it are also very high quality, which is chrome plated brass. The irrigator helps to clean those areas that one can never reach with a brush or floss. This also has a volume control for convenience of use which can be turned entirely on, completely off, or anywhere in between. This device is one that gives immediate results and provides excellent oral health. This model focuses on prevention of oral diseases and helps to fight lots like halitosis and gingivitis. Considered to be part of a dental plan, this device helps to make the gums stronger and prevents bleeding in these areas. The QuickBreeze can be very easily installed onto the sink without the help of other extra tools and detached just as quickly. It is convenient for there is no risk of bacteria growing inside it. There are no loud motors which can be a nuisance, nor does it use any hard chemicals, making it safe. There is a valve which diverts the flow of water, and it has a 24-inch hose that funnels water narrowly with two heads. Can the flosser be used with mouthwash? Yes. Water flosser can be used with clear water, water and mouthwash mix, or even pure mouthwash. You should keep in mind that mouth wash can be sticky, so it is a good idea to rinse the nozzle now and then.